For Commercial or Household use, this high-powered, award winning designed vacuum sealer gets the job done with ease! Simple to use, with results that are comparable to a professional, commercial unit costing thousands. Perfect for protecting meats, fish, vegetables, or your personal possessions from the harmful effects that oxygen or freezer burn may cause. 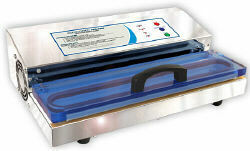 Commercial-grade Vacuum Sealer with an extra large Teflon Bar for sealing bags up to 15" wide. Double piston vacuum-pump delivers 28"HG vacuum strength with 715 watts of power. Easy to use, bright LED lights let you monitor the stages of the sealing process. Automatic Mode has simple one-touch operation....let the onboard computer handle the rest, from vacuuming to sealing. Manual Seal Mode lets you customize & control the amount of vacuum pressure desired for sealing soft foods, photos, valuables or delicate objects. See-thru acrylic vacuum lid for perfect bag alignment while sealing. 23.1 x 9 x 15.4"